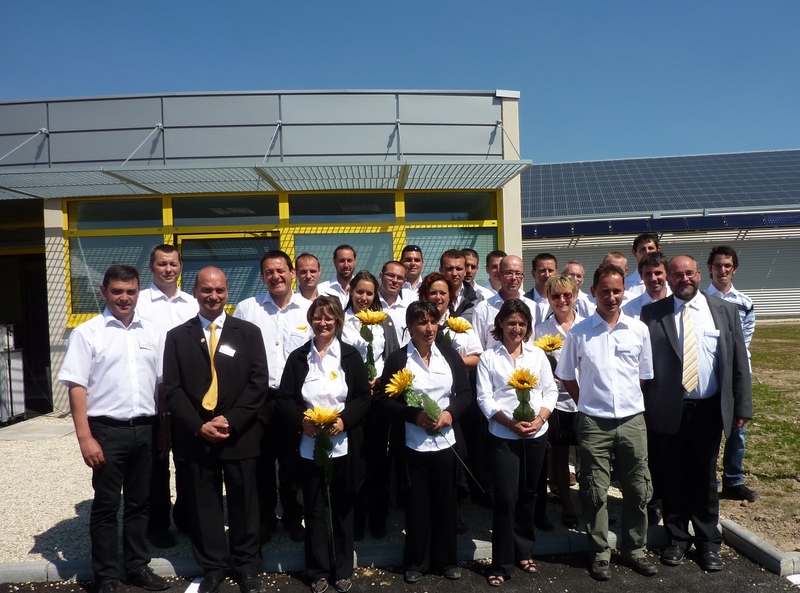 Wagner & Co Solar France SARL inaugurated the new company premises in Simandre. Wagner & Co Solar France, SARL – the French subsidy of the German solar pioneer Wagner & Co Solartechnik, inaugurated the new company premises in the town of Simandre. After its startup in 2007 the company originally was located in Tournus, from where it established a solid position in the French solar thermal and photovoltaic markets. During the last years the sector of large scale solar thermal plants also more and more became a focus and increasingly gained momentum. Resting on these three solid pillars, the company can react flexibly to situations such as the currently hampering political framework. „After all, despite the fluctuating political support, one fact remains“, said Christopher Galopin, sales manager for solar thermal systems, during the inauguration in Simandre: „Solar energy has a bright future, because it is inexhaustible“. This is also embraced by the architectural concept of the new facilities in Simandre: a photovoltaic installation with an estimated annual yield of 480 MWh supplies electricity to the grid, a solar thermal system with 36 collectors as well as a wood pellet boiler assure CO2 neutral space heating. „The ever more restrictive regulations force us to keep reducing our fuel consumption and turn to renewable energy“, Galopin continued. To further promote this approach Wagner & Co Solar France SARL jointly exhibits with the French solar energy association Enerplan at the Intersolar in hall B3, Stand 130.